Has your old weed eater finally given up after many years of faithful service? Or perhaps you got a new model from an impulse buy, and you immediately felt buyer’s regret? 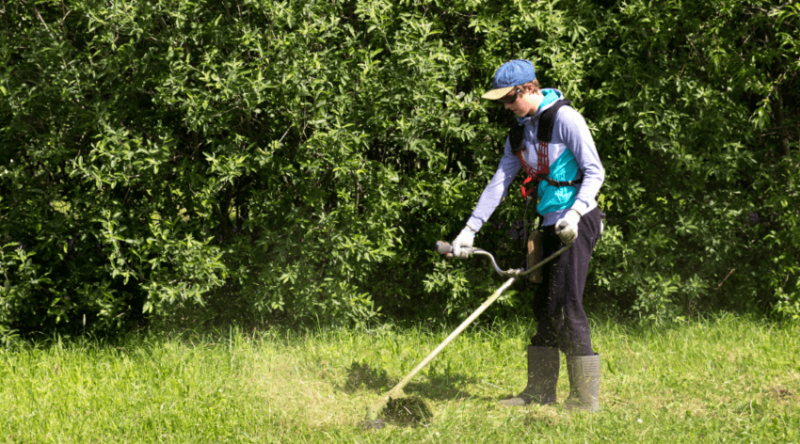 Either way, you now find yourself reading this article, because you are in the market for a new weed eater. 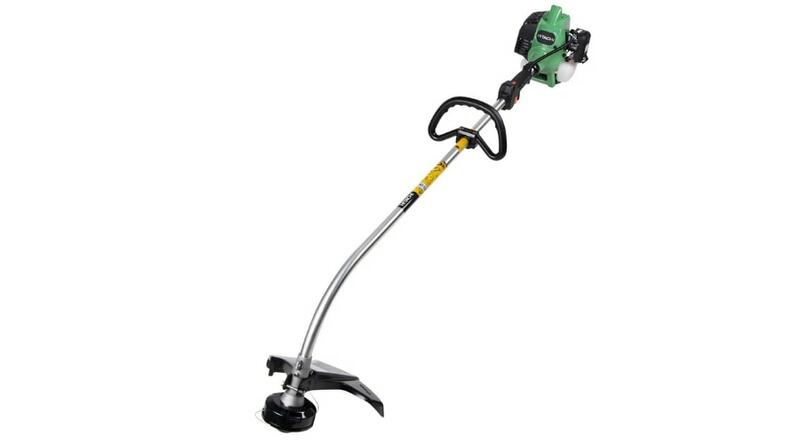 To be specific, you are trying to decide on the Hitachi CG22EAP2SL gas-powered weed trimmer. Hopefully after reading the information contained in this article, you will be better informed about this model, and it will be easier to make your decision. 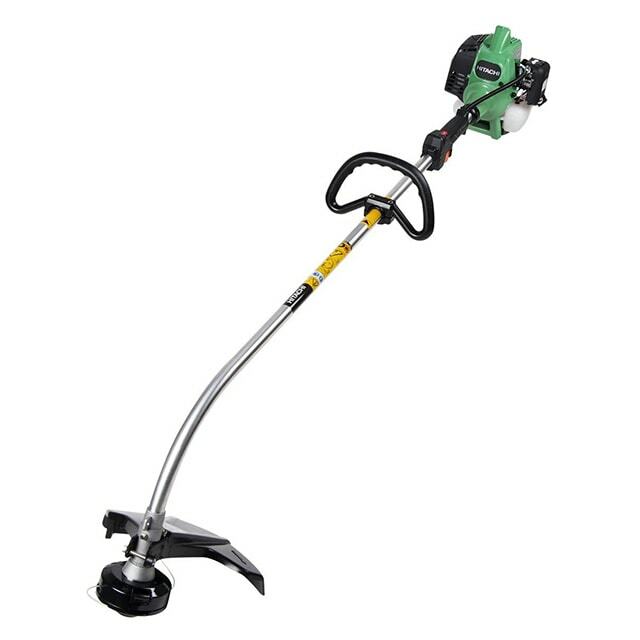 The Hitachi gas trimmer that we are currently analyzing promises to save you time and effort because it allows you to trim the weeds around your garden with ease. This model is run only on gasoline, and it has a curved shaft. Gas machines tend to be more powerful, while models with a curved shaft are more likely to be light and easy to carry.This Hitachi product comes at a reasonable and affordable cost compared to others in its category. It gives the guarantee of being easy for anyone to operate because there is a reduced amount of force that is needed to start it. As well, the machine can be used for a longer period of time before the user will start growing fatigued. This makes it good for people who have trouble with working for a prolonged time frame. 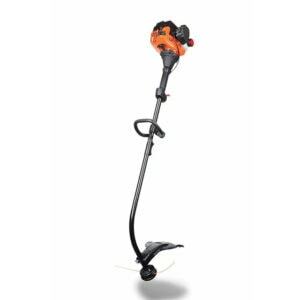 This weed trimmer will operate for semi-professionals, or for yard use. It is also acceptable to use for occasional commercial jobs, but will not be able to handle heavy-duty usage. It has a 2- cycle engine, which means that there are two steps required to create power in the engine. This trimmer has a great deal of good features that it could potentially provide to you. Doing research before a purchase is key because there are so many small details that will all combine to make up your ideal product. 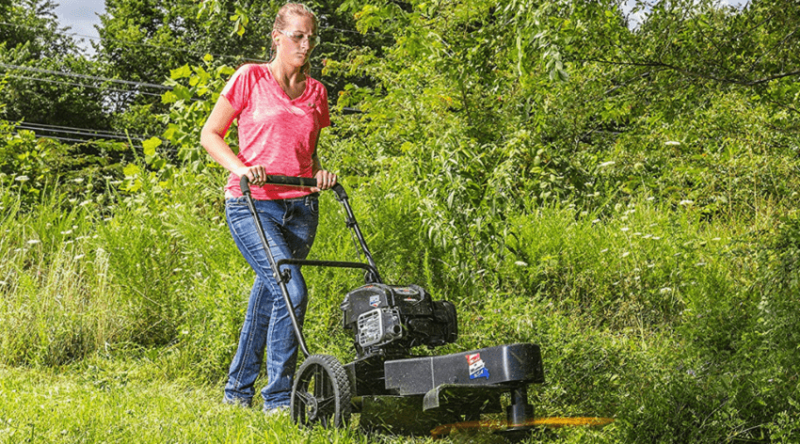 Weed trimmers in particular tend to be built pretty simply, so the extra features can make a huge difference when deciding on a model to purchase. Hitachi products tend to be more durable, rather than cost efficient. This model comes equipped with an S-Start starting system. 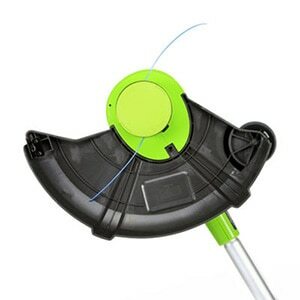 This is very useful because it is able to reduce the amount of effort it takes to pull the string and start the weed trimmer. 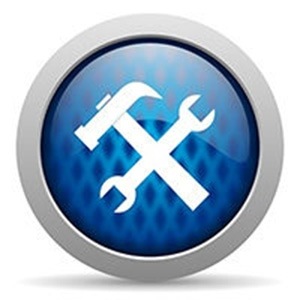 It is more likely that the machine will start without a problem, and will be ready to get the job done. The amount of force it used to take to make weed trimmers start was substantial. It was such a great amount that people with smaller body types and those who had limited strength in their upper arms had difficulty operating the machine. They were sometimes forced to abandon their landscaping efforts, or had to hire someone else to do it for them. Now that technology has improved, more people have the ability to take care of their own yards, even if they have less physical capabilities than others. The downside to this feature is that it adds a bit of extra weight onto the weed trimmer, which makes it slightly harder to carry. With this being said, this particular product is quite small, so the extra weight is not enough to make the product burdensome to use. This Hitachi weed eater has a semi-automatic trimmer head. This means that it is easier for the user to advance the line when they are working. If they find that they need more line, all they have to do is tap the trimmer head on the ground. This will advance the string automatically. This feature is particularly helpful because it saves time overall. The user does not have to turn off the machine or release the harness to advance the line. It can happen while the user is still working, so they do not have to stop and spend extra time. One area of concern is if the string gets stuck in the machine. If this happens to occur, stop working immediately, and troubleshoot the cause of the tangled string. 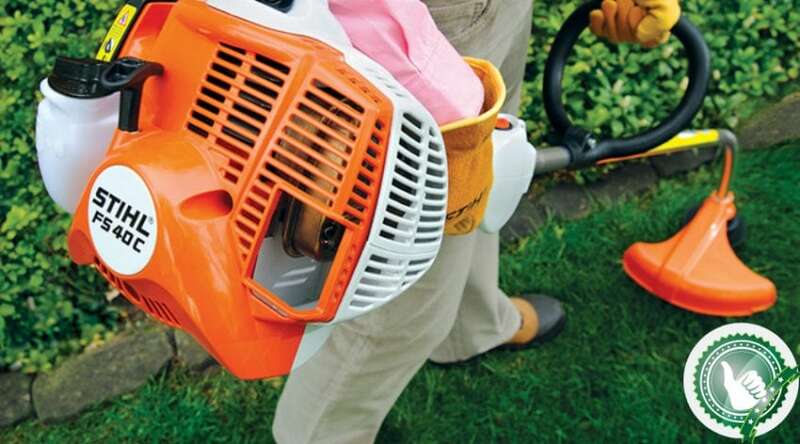 Weed trimmers that have 2-cycle engines are less complex than those with 4-cycle engines. The 2-cycle engine models have less parts, and therefore there is less opportunity for something to malfunction. This also means that they tend to be cheaper, lighter and easier to maneuver than their 4-cycle counterparts. Despite their reduced weight, these machines have a lot of power available, and are fully capable of handling long grass or weeds. Purchasing this type of model certainly has its benefits, however there is a major downside as well. 2-cycle engines require a mixture of fuel and oil in order to run. Typically, the mixture ratio is 50-to-1 and 40-to-1 (gas to oil). As well, these machines may be noisier to run, as they only use two strokes during combustion. If you purchase this particular Hitachi product, the shaft is 54 inches long and curved. With a curved shaft, you will not get as much distance when you are cutting weeds. However, this will make it easier for you to move the machine into small, tight spaces. It is also good for areas such as along fences and hedges. Curved shafts tend to be used in smaller yards, while the straight shafts will be used for more heavy-duty work. 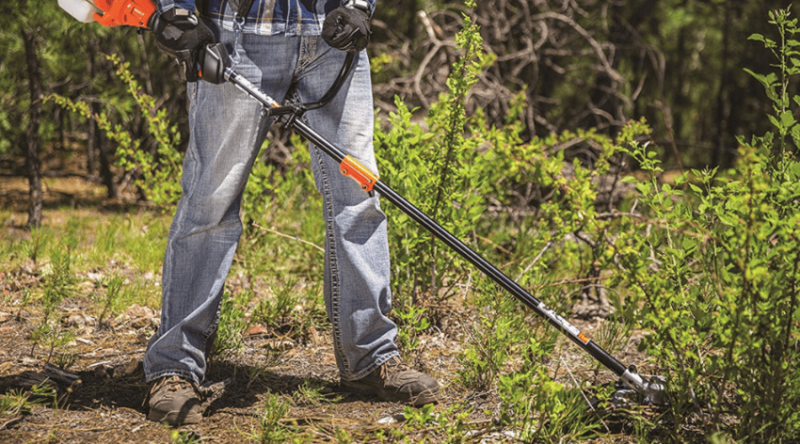 On average, curved shaft weed trimmers are lighter and more comfortable to us. The user has more control over where they want the blade to cut. 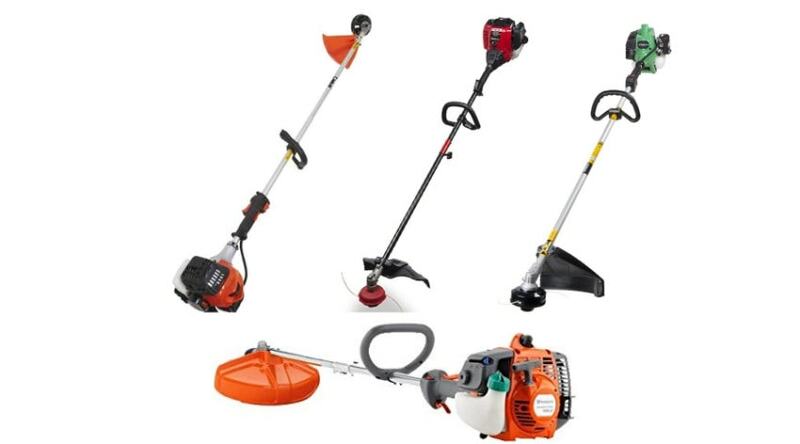 With both types of weed trimmers, there will likely be debris flying in all directions. Be careful to take proper precautions, and keep children and pets out of the way. It is a given that powerful machinery should be comfortable and easy for the user to hold and operate. If someone is uncomfortable or does not have a proper grip on one of these tools, disaster can strike. The Hitachi model that we are looking at has a long handle of 54 inches. This means that the user does not have to bend so much when they are working. This can alleviate back strain and will take less of a toll overall. Another feature this model has is an anti-vibration system. This system has the purpose of absorbing shocks when the machine is in operation. The user will not be impacted by the vibration of the machine, and will be able to continue working in comfort. According to a few online sources, the Hitachi CG22EAP2SLB was ranked second out of five products in its category. The major fact that users didn’t like was that the product does not come equipped with a harness, which can be used while working with the machine. However, users did enjoy the fact that this model has a semi-automatic feed line, and would recommend it to their friends. A second complaint from customers was related to the engine type, not the model itself. Some people did not enjoy mixing the combination of fuel and gas to power their Hitachi machine. They would have been better off using a model with a 2- cycle engine instead. This model is not a cheap knock-off product that will instantly break after using it. Users recognized that it is a quality machine, and that is why it was ranked so highly in comparison to other units. 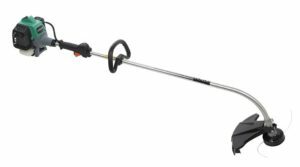 If you, like many of us, prefer to keep a tight budget, a cheaper option for your weed trimmer might be the right way to go. 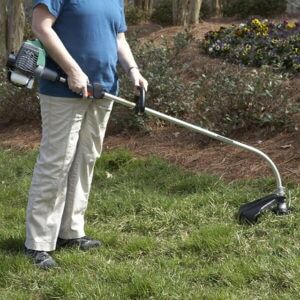 It would be ideal for smaller sized yards, as it has a 16 inch, curved shaft. Just like the other two previous models, this machine has a 2- cycle engine. This model also has QuickStart technology, which is helpful in getting the machine to turn on initially. The final alternative, by Poulan Pro, is a 4- cycle model. These tend to be easier to operate because you do not need to create a gas and fuel mixture. You only need to fill it with gasoline. This particular model is a good fit for people who have large yards, or long grass. It is heavy-duty, and very powerful. As with all power tools, ear plugs are especially recommended when using this product. 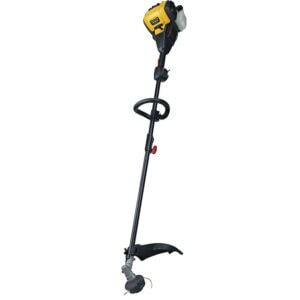 Because it is providing so much power, it will give off more noise while in operation than other weed trimmer models. These models are just a glimpse of all the different options that you can choose from. 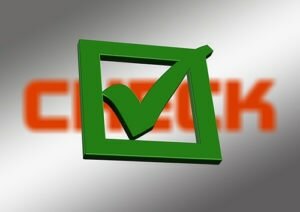 It is a good idea to narrow down your requirements, and decide exactly what it is that you are looking for. This will make it easier for you to do research online, and differentiate between different products and their individual features. It is difficult to completely avoid weeds in life. They are going to show up whether we like it or not. All we can do is be prepared and head them off as soon as we can. 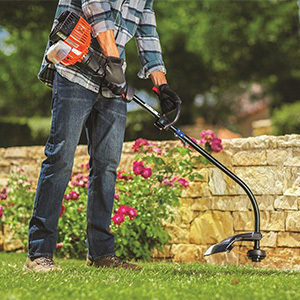 This can be accomplished with the help of the 2- cycle Hitachi CG22EAP2SLB weed trimmer. It is a viable solution to solving your battle with weeds. It is a light machine, and most people have the ability to use it effortlessly. It can handle entire lawns, and will have enough power left to do the backyard as well. The machine is also affordable and powerful. Customers have appreciated the simplicity of this machine, and have rated it favourably. You have the opportunity to try it out for yourself. Click here for more information about the Hitachi CG22EAP2SLB.